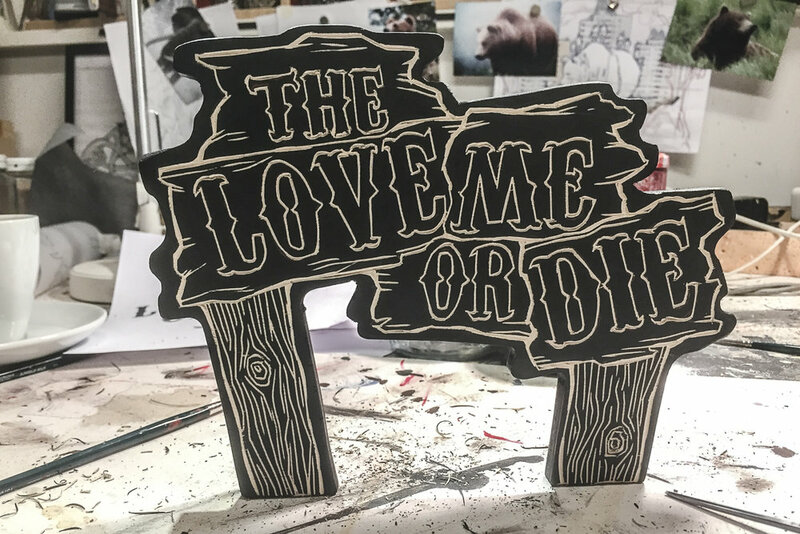 Unfortunately there is no really satisfying update on the delay of the launch of our 2018 artist beer edition "The Love Me Or Die". This years' collaboration brew with Kehrwieder Kreativbrauerei is still on hold at the german authorities, bureaucracy ist preventing us from selling it until we get the necessary okay on the paperwork back. We are very sad about this, not just because this is a passion project of master brewer Oliver Wesseloh & Alex Diamond that took a very long time to realize, but also because this is a more or less uncommercial project that only costs us money as long as we can't move the product. You can pre-order the beer boxes by mail, but that is all we can offer at the moment (please send a note to info@heliumcowboy.com if you are interested). The launch of my latest artist beer with Oliver Wesseloh / Kehrwieder Kreativbrauerei draws nearer. While the beer still needs to be labeled, the limited edition Screen Print just arrived from Berlin's finest printer, Dolly Demoratti (motherdrucker.de). It looks AMAZING! 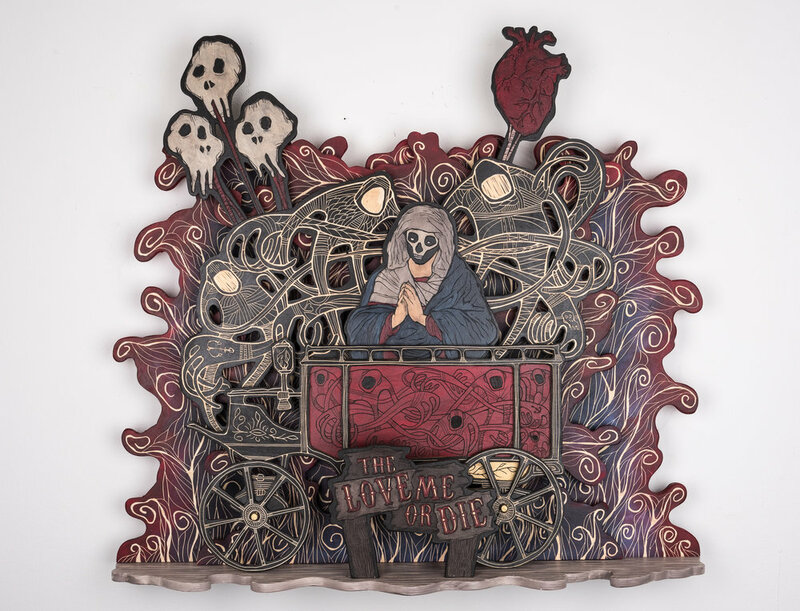 On September 14 we will officially launch "The Love Me Or Die" with a "Beernissage" at the heliumcowboy gallery. This event takes place during the Drunter & Drüber - Neustadt-Festival 2018 on September 14, 2018, from 4–9 pm. 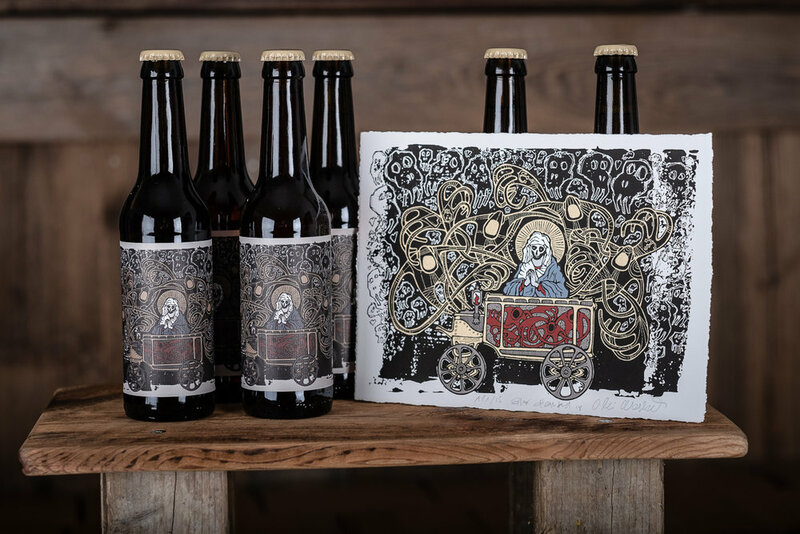 This is the unique first chance to taste the beer and get the limited edition beer box including six 0,33l bottles of "The Love Me Or Die" Spiced Triple and the 8-color silk screen print of the original label artwork that's ONLY available in this box. 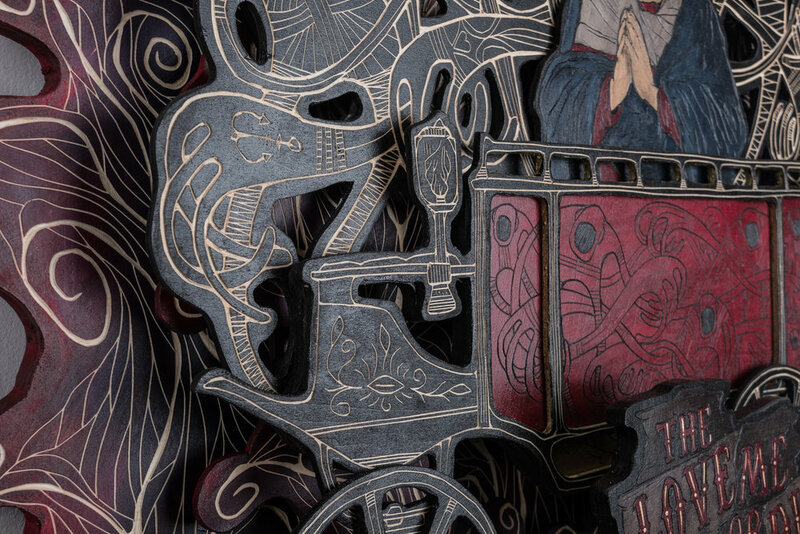 The edition is limited to 100 boxes/prints. Here's a link to the facebook invitation with more info. 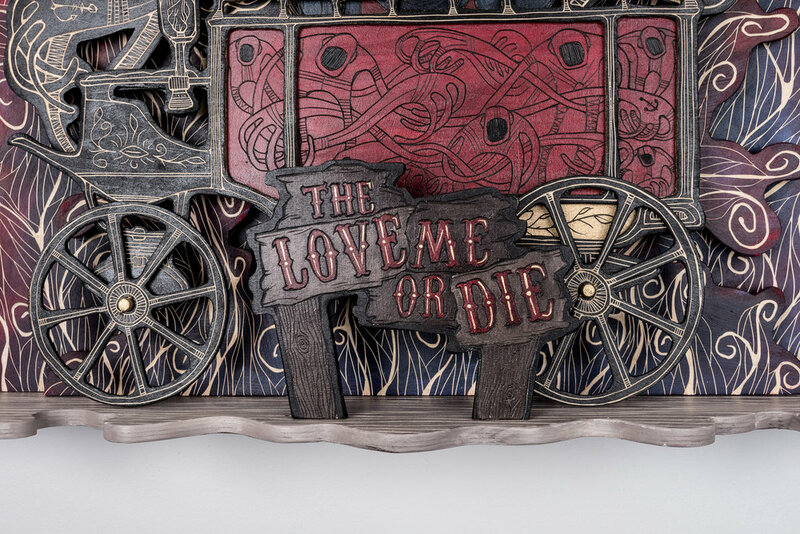 „The Love Me Or Die“ is a sculptural woodcut I created in 2017. It is loosely based upon a song by C.W. Stoneking of the same name (you can listen to the song below). The story told is about desire, love, betrayal, magic and evil. It is a the name of a voodoo spell - if you don’t love me I will put a magic voodoo under your floor and see if this makes you fall in love … or not. The result is in the title. which describe the failure of this delusional attempt to magically influence true feelings. It is not literally about the song, but what you can read between the lines - or the layers, as my artwork is built in multiple levels and set up like a theatre stage or a diorama. 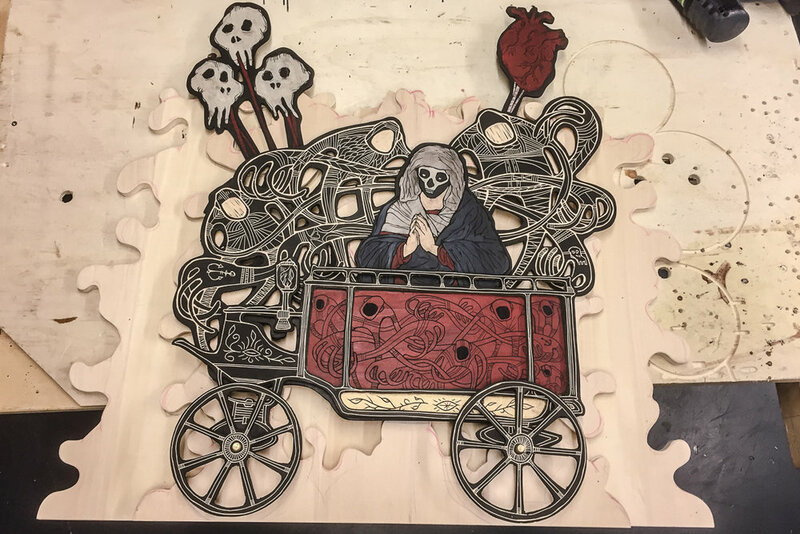 Everything is carved or cut out of wood, painted in different stages of the process and finally assembled. If hung of a wall, it stands out into the room (you can even turn the wheels). For me, an artist who gets a lot of inspiration through popular culture such as music and film it is a wonderful thing to be touched so deeply by a song that it sticks in my head the whole time I spent creating an artwork. It is like a soundtrack in a loop. I even went and started playing it on the guitar and singing it - in my very own way of course, as there is noone I know who could possibly sound like the incredible Mr. Stoneking. PS: There’s another, completely different angle to this piece of mine - it will also become the central artwork for my new „artist beer“ I am brewing up together with Oliver Wesseloh (Kehrwieder Kreativbrauerei) with special support by Scott Jennings (Sierra Nevada Brewery). 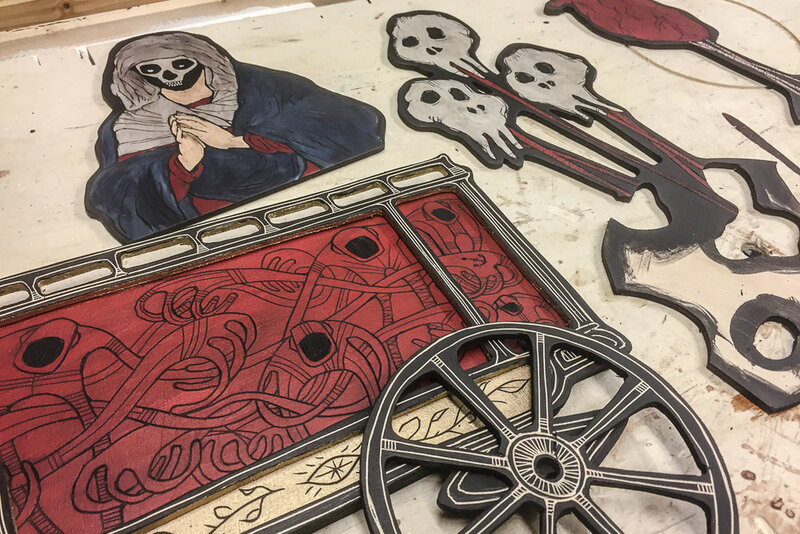 After we released the first artist beer, „The Dirty Hands Of Alex Diamond“ in 2016, the general idea of the recipe is taking the story of my woodcut and the song into a drinkable version. We hope that C.W. Stoneking allows us to use the title of the song for the name of the beer. More later, once we get closer to the final stages of producing this very limited, special artist edition of a beer.